As a parent, you have to make sure that your child becomes independent and also takes courage in doing things on his own. One way you can start developing this in your child is by teaching them how to potty on their own. Not only does this give them the courage and confidence to do things on their own, but it also reduces your burden on the cleaning up as well. Once your child is up and running or more than 18 months old, you can start potty training him or her and teach them to become independent. This is a crucial step to ensure that your child doesn’t have difficulty in using the bathroom on their own. Here are some of the best potty seat/potty chairs to begin with. This is a lovely training toilet for your child that has a realistic design and feels just like an adult toilet. This allows your child to feel more adult-like and also gives them a sense of responsibility. It has a seat, where your child can sit, and a removable, easy-clean bowl. This toilet trainer is perfect for children who are 18 months older and above, until up to 50 pounds. The toilet trainer also has a handle that makes the sound of a flush, allowing your child to think that they have cleaned the potty responsibly on their own, adding to their self-confidence. There is also a built-in wipe compartment at the back that allows you to reach for wipes easily and clean up your child, without any mess. There is also an easily attachable splash-guard for boys. Gives your child a sense of responsibility. Suitable for 18 months and above, until 50 pounds. Easy wipe compartment for cleanliness. Not suitable for babies above 50 pounds of weight. This is a complete all-round potty trainer that not only allows your child to feel like an adult, and it also encourages them to clean after and be more responsible. The easy-access wipe compartment encourages cleanliness. The toilet also helps boost your child’s self-esteem. If you want something that can be placed on top of a regular toilet, then here’s your perfect choice. It can be placed either on the toilet seat or the rim, depending on the height of the toilet. The seat comes with easy assembly, requiring you to use no tools. The seat is foldable as well and can be stored away easily. The seat comes with a step for your child to keep their feet on and handles on either side to give a sturdy grip for your child. The seat is ergonomically contoured and also cushioned to give your child absolute comfort. It has a built-in deflector for boys as well. It also comes with non-slip floor pads that keep the seat in place while they are doing their business. The seat can boost your child’s confidence and make them feel more responsible. However, make sure that your child is never left unattended when using the toilet seat. Step to keep the feet. Non-slip floor pads to ensure no slippage. It has a specific height that might not fit toilets that have a different size. This toilet seat adjusts to a regular adult toilet, preventing you from the hassle of cleaning a bowl after your child is done with their business. The seat is cushioned and specially shaped along with two handles to give your child the grip they need. Simple and perfect for beginners, this potty chair has an ergonomic design that is comfortable for your child. It has a sturdy design along with a grip along the bottom to prevent it from slipping. The seat has a high-backrest and armrests that allow your child to sit comfortably and also do other things while they potty. 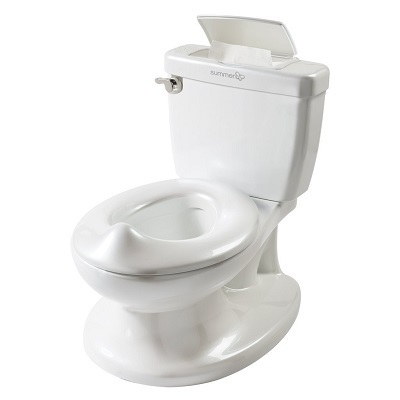 The potty seat comes with an easily-removable bowl that can be cleaned and placed back. The bowl has an in-built splash guard that prevents any splashing. The seat is made from BPA-free material, making it safe for your child. Simple and easy to use the potty trainer. High backrest and armrests for absolute comfort. Built-in splashguard to prevent splashing. Easily removable bowl for cleaning. The bowl will need to be cleaned after each use. Doesn’t fit a regular toilet. 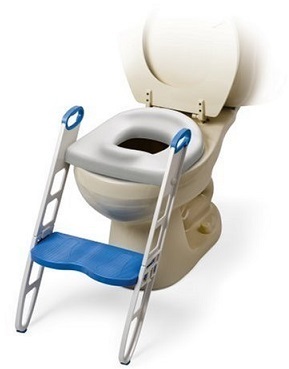 It has a simple design that prevents you from the hassle of assembling a step-up potty trainer. Ergonomically designed, the backrest and armrests ensure that your child is absolutely comfortable to finish their business with ease. The bowl can be removed and easily cleaned as well. If you’re looking for something adorable for your little girl, then here’s a specially designed potty chair for girls. The 3-in-one toilet trainer not only allows your child to learn how to potty on her own, but it can also double as a stepping tool, and the removable seat can be placed on top of a regular toilet as well for when she grows older. The seat is designed to keep her comfortable and comes with an adorable Minnie mouse graphic that your child will adore. There is a lovely little handle on the side that she can press once she is done and yell ‘hip-hip-hooray” to boost her confidence and build on her self-esteem and responsibility. The potty trainer also has a sturdy base to ensure that it remains in place whenever she is doing her business or using it as a step stool. 3-in-1 design for potty training with a removable seat and can also be used as a step stool. Removable seat can be placed on a regular toilet as well. Sturdy base to prevent slipping. Comes in a lovely pink color with a Minnie mouse design. The lovely potty trainer for girls has a 3-in1 design that allows the trainer to be used as your child grows older. 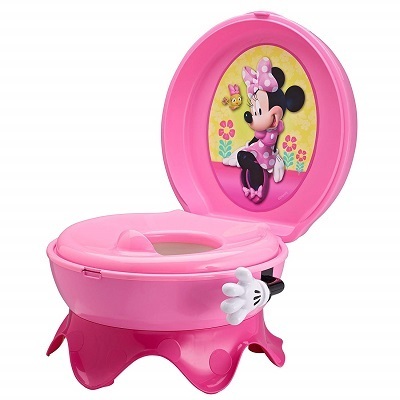 With a lovely pink color and a Minnie mouse design, the potty trainer is sure to be adored by your child while doing her business. The removable seat can be placed on a regular toilet as well as your child grows older to allow her to make the transition from a potty trainer to a regular toilet more easily. 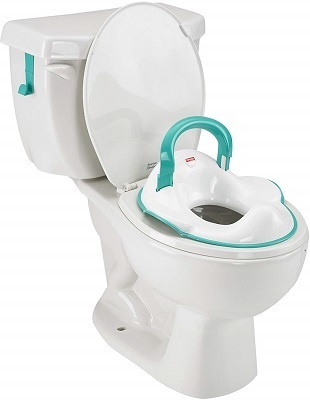 This potty ring is another perfect potty trainer seat that fits onto most standard-sized adult toilets. 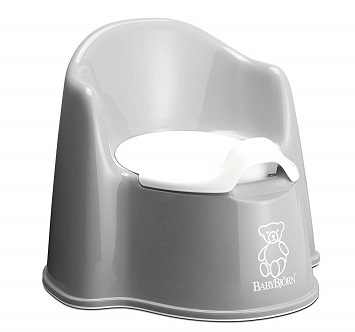 It has a specially contoured seat that gives your child the comfort they need when doing their business. It can be easily placed on the toilet seat of a regular toilet, and the handle on the back can be pushed inside to fit perfectly. The rims are lined with non-slip padding that keeps the seat in place and prevents slipping. The seat comes with handles on the side to give your child the grip they need. There is an in-built splash guard that prevents any splashing. And since it fits onto most regular toilets, it prevents you from the hassle of cleaning up a bowl. Once done, the seat can be removed and hanged or stored someplace easily. Fits most standard-sized adult toilets. Non-slip padding on the bottom to keep the seat in place. Handles on the side to give your child the grip they need. Can be easily stored away when not in use. Adult supervision is always necessary. Might not fit adult toilets that come with a special or unusual design. This toilet seat allows your child to start sitting on the adult toilet seat, adding to their self-esteem and sense of responsibility. The seat is comfortable with handles on the sides and can be stored away when not in use. It is important to allow your child to become responsible, and the first step to the same is potty training. They build on their self-esteem as well. Each of these best potty training seats and chairs is specially handpicked to ensure that your child is safe and comfortable at all times. They allow your child to easily transition from diapers to potty trainers into finally an adult toilet.